In any AX/D365 environment, there's often a need to get the Args.Caller().Name(), except not all possible caller's will have a .name() method, so here's a little function that can be added to a form to get the caller's name in a more proper method. I had a customer who needed to convert a decimal to fraction, so I just translated this StackOverflow post where all credit is due. I'm sure someone else will find it useful at some point. The two main things in the job below (details taken from StackOverflow) are "_real", which is the value you want to convert, and "_accuracy", which specifies the max relative error; not the max absolute error. So _accuracy = 0.01 would find a fraction within 1% of the value. I also quickly threw this job together, so I didn't test for extremely large integers or any edge cases. Here's a simple job that demonstrates how it works. 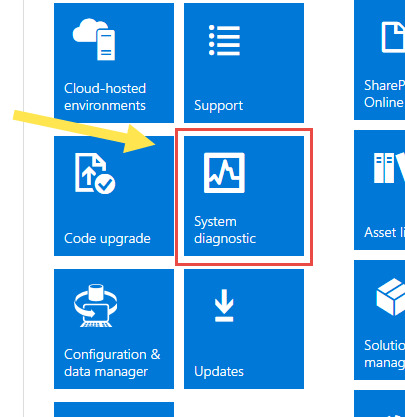 Microsoft automatically cleans up the "DeployablePackages" folder for data older than 30 days on your Dynamics 365 for Finance and Operations, Enterprise Edition machine if you are using the LCS servicing flows. See Yammer thread here for Microsoft's comments. I am maintaining an ISV solution across AX 2012 and Dynamics 365 for Finance and Operations, Enterprise Edition, and when there is development in one, porting those changes to the other can be a hassle. If I create a label in Dynamics AX 2012, exactly creating it in D365 isn't straight forward/simple. I quickly wrote this simple job to export a label to a format that can be easily imported into Dynamics 365. I simply looked at how D365 label text is stored and inferred this, so I haven't done extensive testing, but it seems to work fine for several hundred labels when comparing via WinMerge what my job outputs vs what D365 contains. 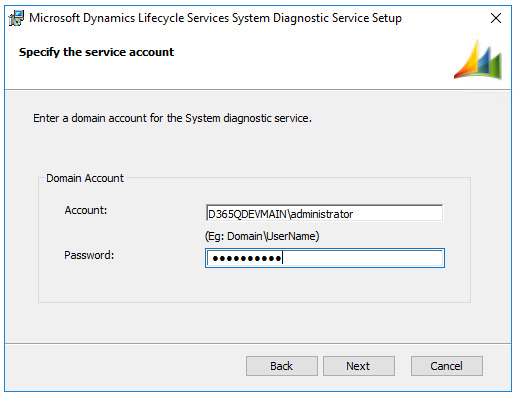 Whenever I get a new D365 virtual machine, I need to rename it, link it to LCS, and join it to our domain. I kept forgetting what I did, so I wrote it down here to share. I rename it because there are multiple copies of the VM on the same network, and joining to a domain should be obvious all of the benefits there. So here are the steps that I perform to quickly do this, and if anyone has any other steps to add/modify, please let me know and I'll update the post. Follow carefully as each step is important. Go to Control Panel>System and Security>Security, click "Change Settings", and rename the machine to something unique. 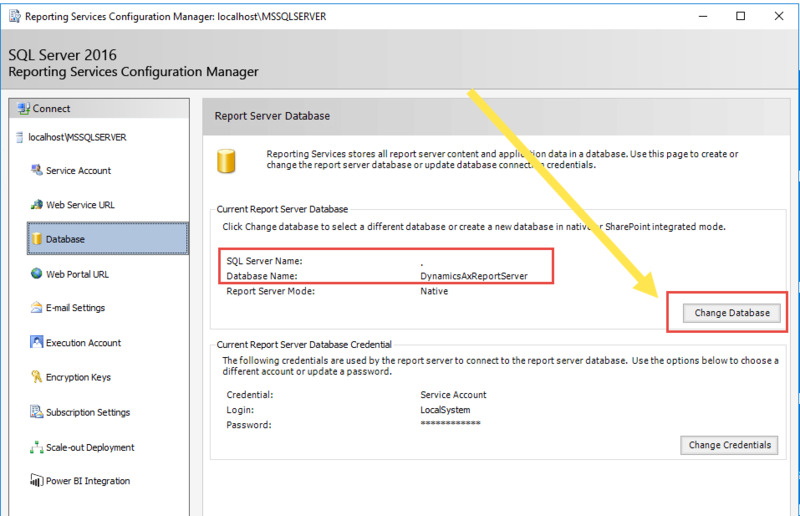 Open SQL Management Studio by doing "Run As Administrator", as the Local Admins security group is added but not the local administrator user. 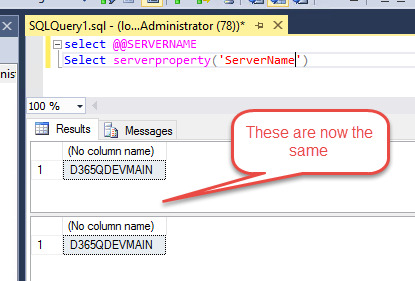 Connect to SQL. 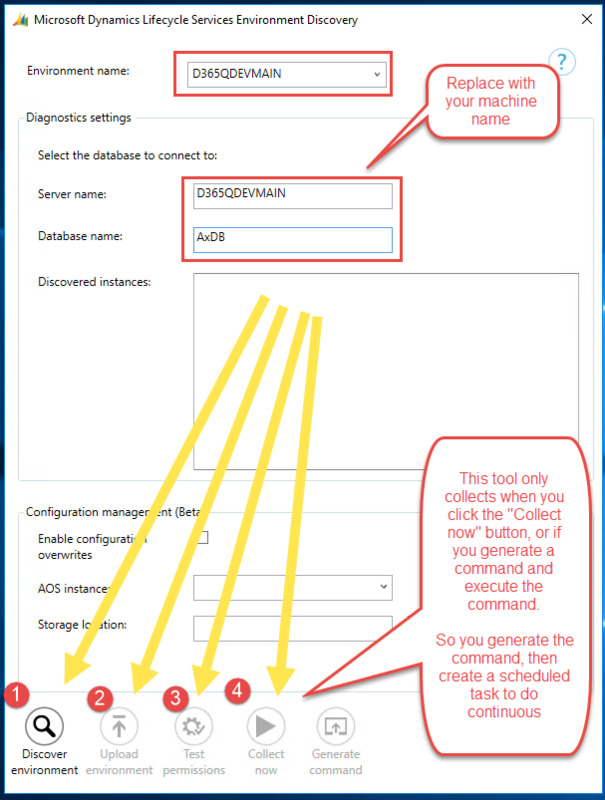 (Optional) The following steps are the optional LCS/Domain steps. Create a project in LCS that your D365 for Operations (or whatever it's called at the time of reading this) VM will connect to. (Optional) Extract and run Setup. Choose "Create a new certificate" and enter whatever into the prefix. I usually just do the machine name. 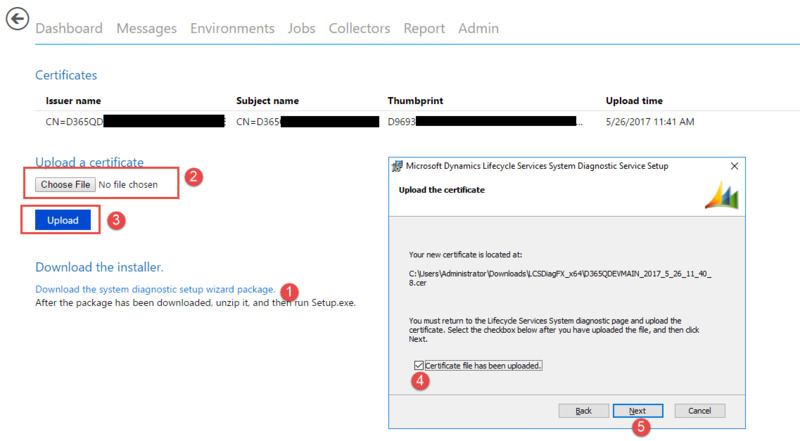 (Optional) This creates a certificate in the same directory as the installer, upload the certificate back into LCS under the same tile, then continue with the installer after it has been uploaded. (Optional) For the account/password I put in MachineName\Administrator and the administrator password. If you choose to use the local admin, it's important that you type the newly created machine name you chose or it doesn't always work. 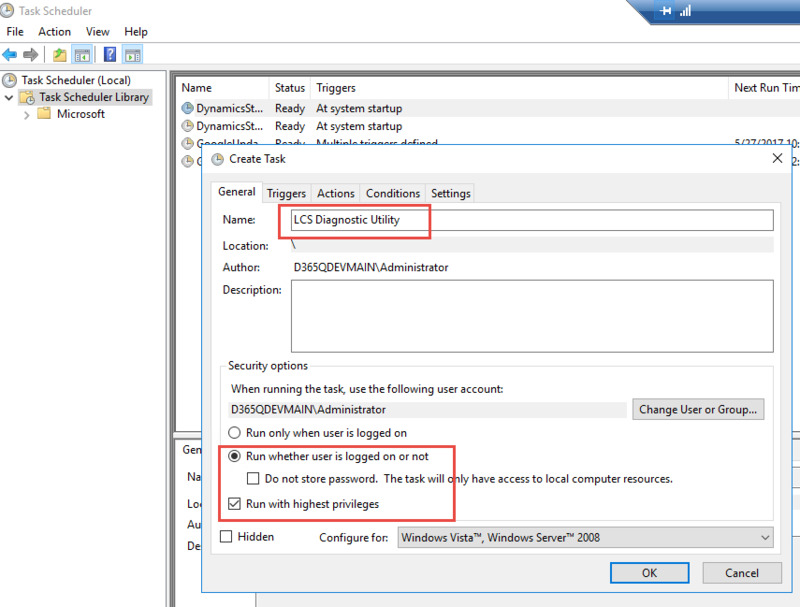 (Optional) There should now be a new icon on your desktop to launch the LCS diagnostic utility. Run this. 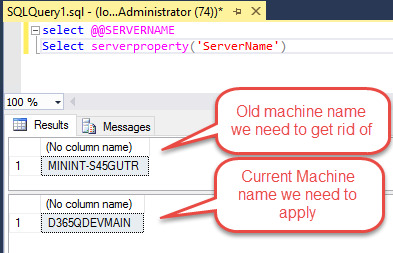 (Optional) Put in the environment name and server name with your newly chosen name and put "AxDB" for the database name. Then click the buttons at the bottom of the tool in sequence. 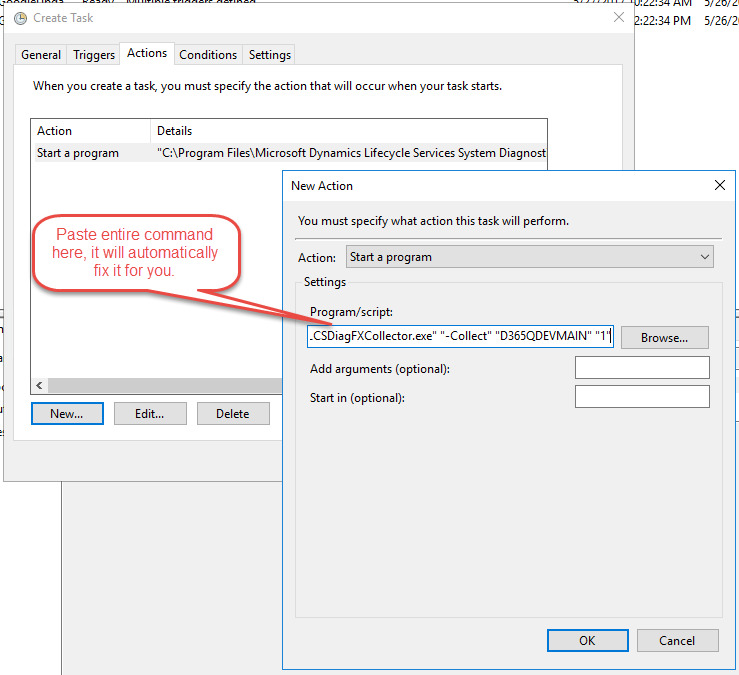 "C:\Program Files\Microsoft Dynamics Lifecycle Services System Diagnostic Service\LCSDiagFXCollector.exe" "-Collect" "D365QDEVMAIN" "1"
(Optional) Open "Task Scheduler" and create a new task and choose "Run whether user is logged on or not" and I choose "Run with highest privileges"
(Optional) Choose the "Actions" tab, click New, and paste the entire command in the program/script window and click ok. It will prompt you to automatically fix it so just click yes. (Optional) Finally join it to your domain and restart.